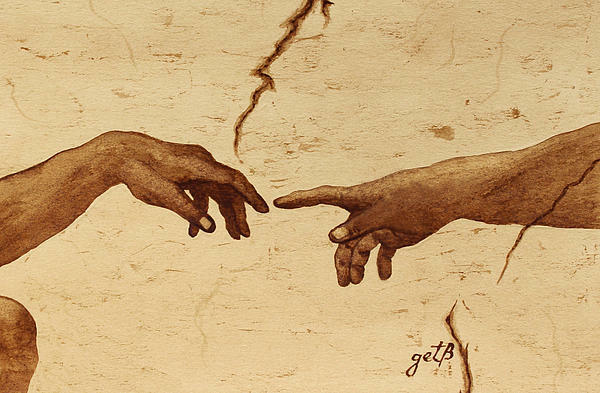 There are no comments for Creation Of Adam Hands A Study Coffee Painting. Click here to post the first comment. 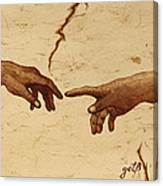 The Creation of Adam is a section of Michelangelo's fresco Sistine Chapel ceiling painted circa 1512. It is traditionally thought to illustrate the Biblical creation narrative from the Book of Genesis in which God breathes life into Adam, the first man. 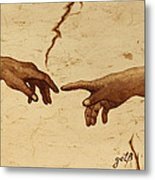 Chronologically the fourth in the series of panels depicting episodes from Genesis on the Sistine ceiling, it was among the last to be completed. 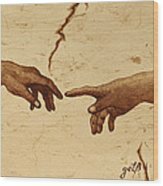 It is the most well-known of the Sistine Chapel fresco panels, and its fame as a piece of art is rivaled only by the Mona Lisa by Leonardo da Vinci. 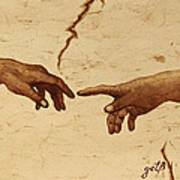 The image of the near-touching hands of God and Adam has become one of the single most iconic images of humanity and has been reproduced in countless imitations and parodies.